A NATO center for studying, creating, and perfecting the capacities of the Alliance in crisis management and disaster relief is to be set up in the Bulgarian capital Sofia, Bulgarian Deputy Defense Minister Avgustina Tsvetkova announced Tuesday. NATO's Sofia crisis management center will first be based in the Shipka hotel, which is owned by the Bulgarian Defense Ministry, but will later be housed in a building of its own, she added, as cited by Mediapool. According to Tsvetkova, the NATO center in Sofia will not have operational tasks and will focus on drafting strategic papers and training experts. "Bulgaria has not only coped well with recent crisis but it also has the capacity to provide well-trained specialists that can be useful to other NATO member states," Bulgaria's Deputy Defense Minister said. The NATO Crisis Management Center in Sofia will employ about 50 experts; 27 of those will be from the Bulgarian Defense Ministry, while 10 will be international experts from other NATO members, she explained. The NATO center will be an inter-institutional body in the sense that it will work with the Bulgarian ministries of interior, justice, education, healthcare, and the Bulgarian Academy of Sciences. It will also use existing resources of the Sofia Military Academy "Georgi S. Rakovski" including the military training complex Charalitsa. 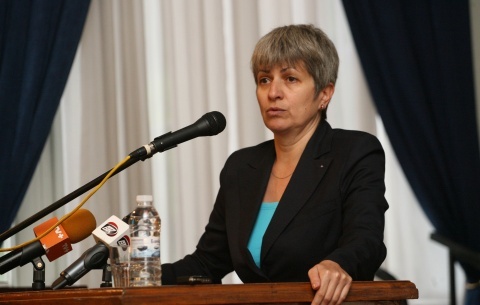 Tsvetkova spoke Tuesday in Sofia at an international conference dedicated to the opening of the NATO center. The decision to create a NATO crisis management center in Bulgaria was made by the Bulgarian Cabinet in November 2012 as Bulgaria's contribition to joint NATO capabilities for crisis management.